bags of garbage dumped last night on both sides of Martin Luther King Blvd @ West Grand Avenue. OAK 311 has received this issue. Your service request ID is #897788. Please check back for status updates, or contact us directly at 510-615-5566. The City of Oakland addressed this issue on 04/23/2019, service request #897788. OAK 311 has received this issue. Your service request ID is #898293. Please check back for status updates, or contact us directly at 510-615-5566. 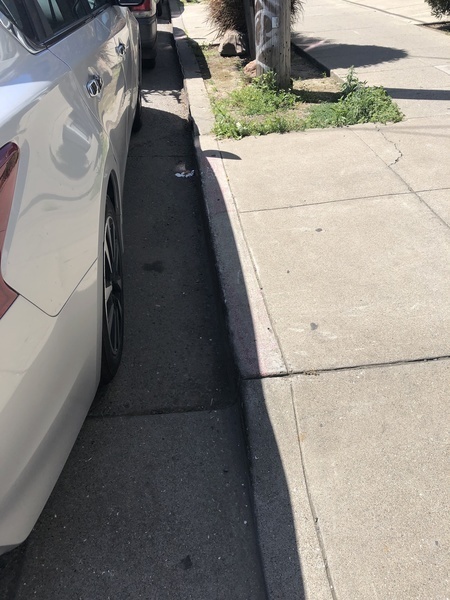 The City of Oakland addressed this issue on 04/23/2019, service request #898293. OAK 311 has received this issue. Your service request ID is #890142. Thank you, in advance, for your patience as we work through a backlog of pothole service requests. Unfortunately the City does not have enough funding to repave all streets in poor condition. With limited funding, our response to resurfacing requests is limited to minor pavement and pothole repairs only. Our Street Maintenance Department will assess your street and determine whether temporary measures might be appropriate. Please understand that this work may be limited to pothole or other minor repairs, and that we have many similar requests. We will do our best to respond in a timely manner. The backlog of streets in Oakland needing pavement currently is $435 million and growing. The City of Oakland addressed this issue on 04/23/2019, service request #890142. OAK 311 has received this issue. Your service request ID is #898121. Please check back for status updates, or contact us directly at 510-615-5566. I am sure some good hearted citizen dumped them off for the people in the tough sheds to pick though. This is illegal dumping and it needs to stop. This kind dumping and dumping your old food is not helping these people. Some potholes are almost 3~4inch deep. Entire 24th St. condition is really bad since high volume of traffic coming from Northgate Ave. day and night. OAK 311 has received this issue. Your service request ID is #897427. Thank you, in advance, for your patience as we work through a backlog of pothole service requests. Unfortunately the City does not have enough funding to repave all streets in poor condition. With limited funding, our response to resurfacing requests is limited to minor pavement and pothole repairs only. Our Street Maintenance Department will assess your street and determine whether temporary measures might be appropriate. Please understand that this work may be limited to pothole or other minor repairs, and that we have many similar requests. We will do our best to respond in a timely manner. The backlog of streets in Oakland needing pavement currently is $435 million and growing. Our condo's garage way is facing to 24th St. The curb paint is faded on both side of our drive way. So many people are blocking our drive way with their cars. We requested to repaint for more than 4years. City public work has never sent anybody to fix them. OAK 311 has received this issue. Your service request ID is #897429. Please check back for status updates, or contact us directly at 510-615-5566. Hopefully they will show up this time to fix potholes on 24th St. and repaint the curb around 24th St. even facing to Telegraph Ave. Please also contact the PWD call center 615-5566 or 311 and ask why this was not referred the first time. For cars blocking your driveway call OPD 777-3333 to them have towed. Trash needs to be collected from homeless encampment. It stinks the entire street. OAK 311 has received this issue. Your service request ID is #896469. Please check back for status updates, or contact us directly at 510-615-5566. Yes, our Street is being trashed and burned by the homeless encampments and the City still allows it in our Residential Street. Across from 521 sycamore street. OAK 311 has received this issue. Your service request ID is #887317. Please check back for status updates, or contact us directly at 510-615-5566. The City of Oakland addressed this issue on 04/17/2019, service request #887317. OAK 311 has received this issue. Your service request ID is #894910. Please check back for status updates, or contact us directly at 510-615-5566. OAK 311 has received this issue. Your service request ID is #895541. Please check back for status updates, or contact us directly at 510-615-5566.